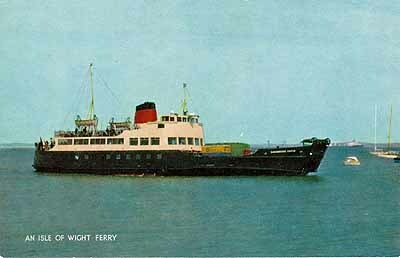 MV Carisbrooke Castle was purpose built for Red Funnel by Thornycroft at Woolston for the Cowes/Southampton route. Although she operated between East Cowes and Southampton, she would moor alongside the pontoon at Cowes to collect passengers and enable car to embark/disembark through the side of the car deck. At East Cowes and Southampton, she would go into the slipway/link bow first for vehicles to embark and disembark - there was a turn-table in the back of the vechicle deck so that vehicles could be turned around. She was able to make the journey between Southampton and Cowes in about 40 minutes. She was sold in 1974 to operate in Naples.